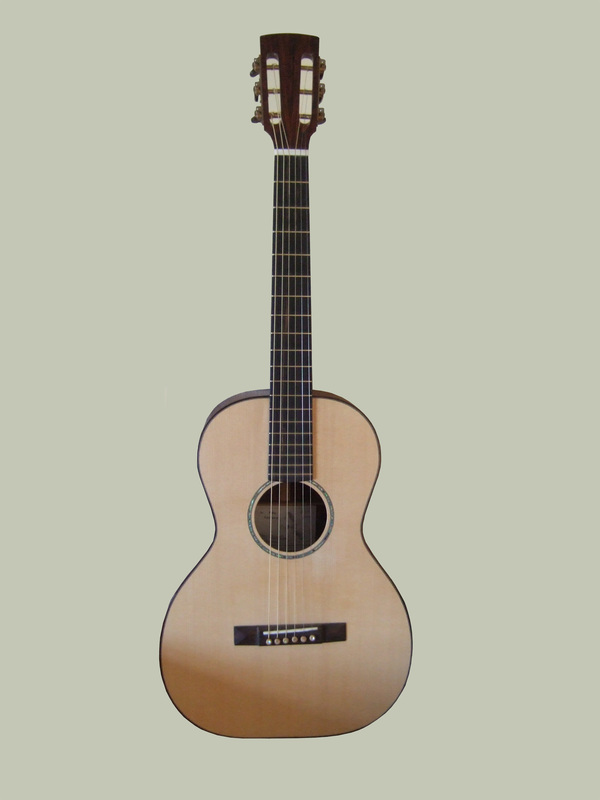 This small-bodied guitar was commissioned from Ian Chisholm about two years ago - we drove to Tonbridge in Kent to buy the woods from a specialist timber firm. Anyway, the back and sides are cocobolo, which is incredibly hard and very beautiful and, once again, the weight of this little guitar is very light and - yet again - the volume and projection are immense for its size! The face is spruce and the very nice tuners are of brass and snakewood. It's absolutely perfect for fingerpicking. I've now had it fitted with a K&K pickup system - sounds great through my Roland Cube! Strung with Elixir Bronze Nanoweb .011-.052 strings.